The Simple Way Leads You To Us. From Cologne use A 61 (Koblenz-Venlo). Take the exit "Bergheim Süd". 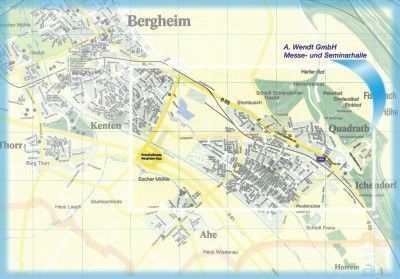 Turn right and drive approximately 1 km to B 55, street name: Köln-Aachener-Straße. 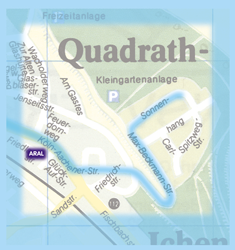 Turn right and remain on B 55, cross the small town of Quadrath-Ichendorf until you see a deserted service station area at the right side. Cross the intersection secured with light sign installation and turn half-left approximately 100 m behind the intersection. Here you will find a sign of some companies located in this industrial estate "Sonnenhang"
Follow the course of this street, which passes after a gradient into Max-Beckmann-Straße, as far as to the second crossroad on the right side called Sonnenhang..
You find us at the end of the road on the left side. There are sufficiently car parks in front of our buildings.